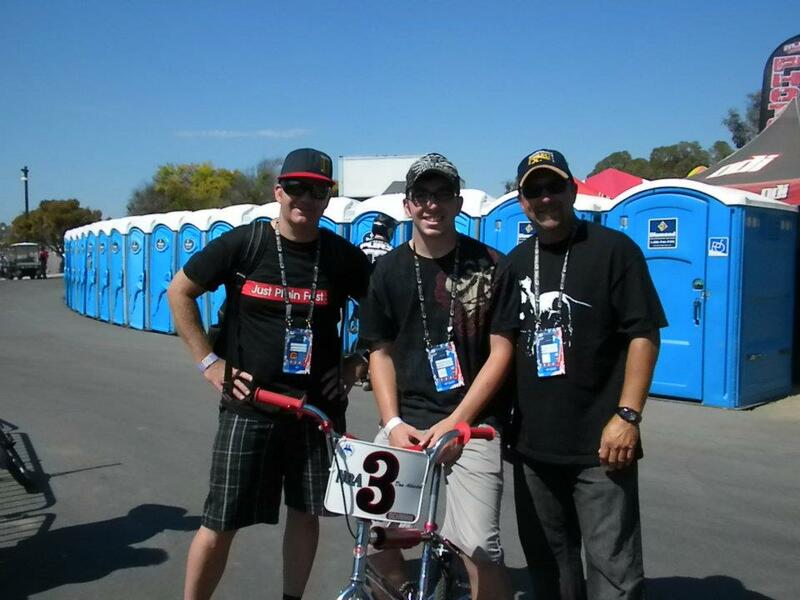 Me with Evan and his dad Donnie, the newest member of the BMX Hall of Fame. 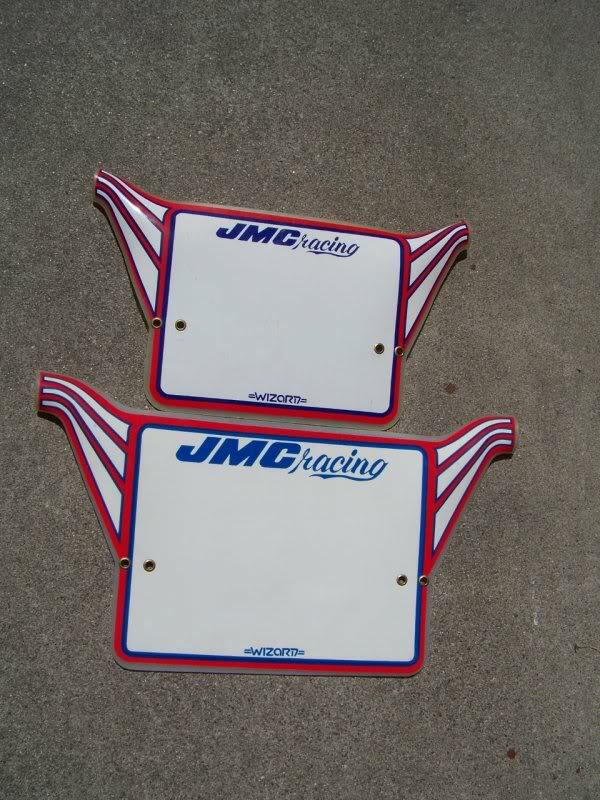 Recently, Evan Atherton contacted me about making him a couple of number plates. He said he was building a replica of his dad’s Schwinn Sting. His dad is none other than Donnie Atherton, one of Schwinn’s top racers in the late 1970s and early 1980s. He was regualrly featured in Schwinn ads and in the pages of Bicycle Motocross Action magazine and others. Evan sent me a few photos of his dad running three different plates. 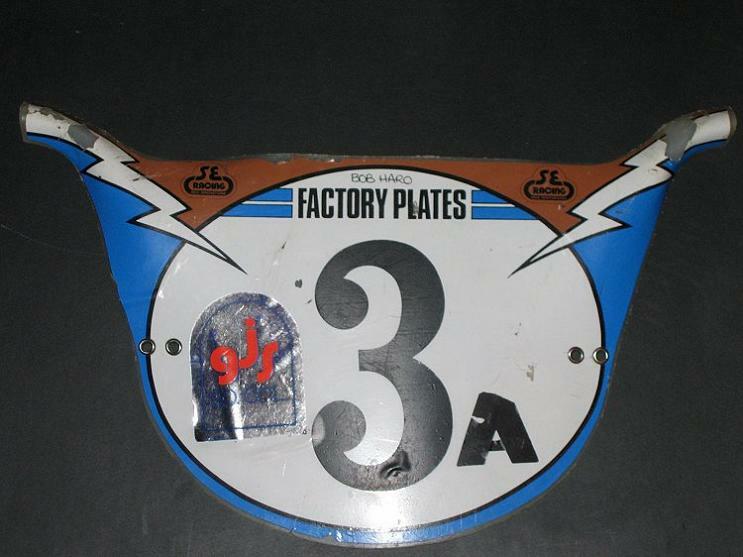 He had a favorite, but it wasn’t the plate that his dad ran on the bike he was replicating. Unlike the Haro-style plates I usually build, these were the earlier and more common square plates. 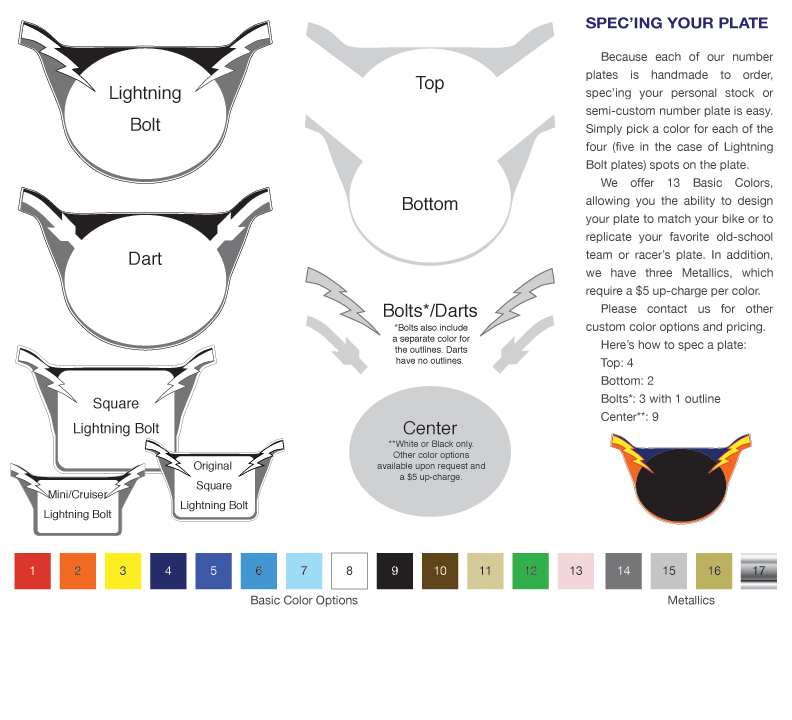 I told him I couldn’t make the plates, but if he could fine two of them, I’d gladly replicate all the graphics I could. Some of the stickers were beyond my current abilities. He was cool with that. Evan asked me to make two plates, one with the number 20 and one with the number 3. Donnie ran both plates in 1979. I made both and was really stoked on the results. So was Evan. He plans to put one on the replica when it is finished. I plan to write a little story here after he gives it to his dad. 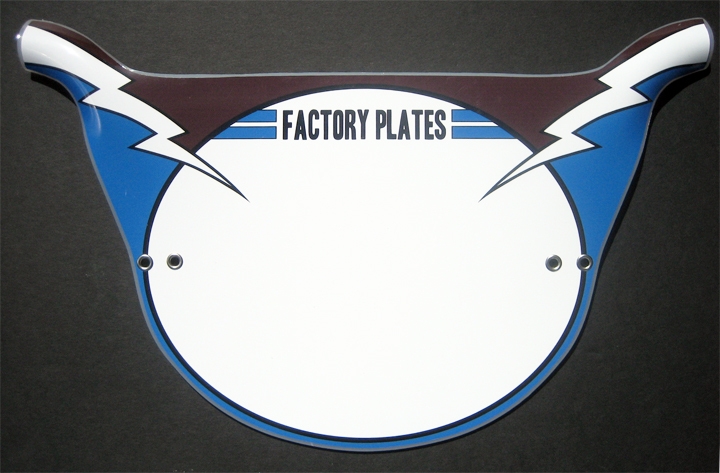 Here are the plates Donnie ran and the ones I made. Last week, the American Bicycle Association (ABA) started asking for nominees into the BMX Hall of Fame. Each year, the ABA adds the names of those who significantly contributed to the sport. Nominees in the categories BMX Pioneer Racer (1979 or earlier), BMX Racer (1980 to modern day), BMX Industry Member and BMX Freestyler are voted on by the public, a public that has forgotten the contributions of many of those who were at the forefront of the sport when it was still in its infancy. One of those pioneers is Steve Johnson, Torker’s president from 1976 to 1984. Steve has been on the list of nominees for years, but he and his groundbreaking company and race team apparently are all but forgotten. The role Steve played in the early years of the BMX industry and racing was as revolutionary and vital as those played by other revered industry legends whose names are uttered and written almost daily in conversations and on the Internet by BMX collectors and fans who reminisce about the good old days. Last year, I voted for Hall of Fame inductees for the first time. As I scanned the list of nominees, I was shocked by the number of people I assumed were already in the Hall. Steve Johnson was among them. He immediately got my vote for BMX Industry Member. I also attended the induction ceremony in San Diego where I ate dinner with Hall of Famers Bobby Encinas and Eddy King. As Eddy and I chatted, he noted that he, too, thought there were a lot of people who deserved to be in the Hall who weren’t. Steve Johnson was first on his list. We agreed right there to get him into the Hall of Fame. And so, my campaign to get Steve in the BMX Hall of Fame begins here, today. Although I have never met Steve, I have spoken about him with his father, racers who were on the legendary teams he put together in the 1970s and 19980s, as well as others who worked with him back in the day. Everyone I’ve spoken with liked and respected him. Spend a little time reading through old issues of BMX magazines from the 1970s and 1980s and it’s clear that he had a huge impact on the sport. It’s also clear that the industry recognized his impact, even then. 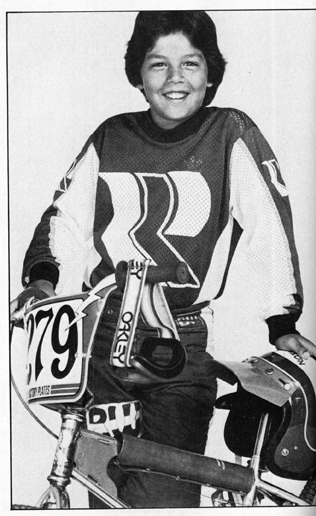 In the November 1980 issue of Bicycle Motocross Action magazine, Bob Osborn wrote the following about Steve Johnson. One of the neatest things about the Great Lakes National was the way Steve Johnson, the young owner of Torker, handled the sponsorship of this race. The Torker gang arrived early and hauled buns all week long to assure that the race, as well as their sponsorship, was a success. You might say they were max-imizing their investment as sponsor. In the past, some sponsors have forked over their fee, stuck up some banners, and suggested that the race announcer give them a mention now and then. Steve Johnson decided to go full boat. During the week he visited as many local shops as he could, to pump up the race and Torker products. Borrowing from Grand Prix tradition, he set up a Torker hospitality area where the press, shop owners, and public could meet the Team Torker racers. And sodas and sandwiches were available to cure any rampant munchies among the VIPs. Steve also prepared assorted promotional blurbs for the race announcer, Merle Mennenga of the ABA. Torker banners were placed strategically where the pro photobugs would most likely be shooting pics for their publications. Then the blank spots were filled with other banners and posters. Promotion wasn’t the only thing on Johnson’s mind. Saturday saw him and his Torker lieutenant, Karsten Berg, manning the shovels and working with the race officials to make sure the rain drenched track was prepared as well as humanly possible. In taking such total and dedicated control of the promotional aspects of the race, Steve Johnson established a guideline, a new standard for sponsors wishing to get their money’s worth out of an event. What Torker did in Lansing was demonstrate just how much goodwill and publicity for a sponsor’s products can be realized by jumping in feet first and doing a super job that benefits not only themselves, but everyone attending or participating in a national. 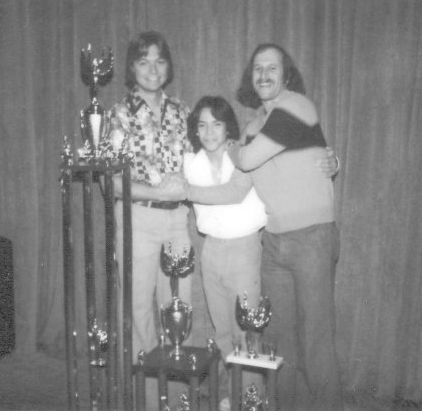 Steve Johnson (Left) with BMX Hall of Famers Eddy King and Sandy Finkleman. Steve co-sponsored Eddy with Sandy, owner of Wheels-N-Things, before he launched the Torker Factory Team in 1978. Between 1976 and 1984, Steve took Torker out of the family garage and built it into one of the BMX’s best-known and best-selling brands during the sport’s first big boom. He had a knack for identifying and signing some of BMX’s all-time best riders, allowing him to build and manage one of the BMX’s most dominant and successful race teams. 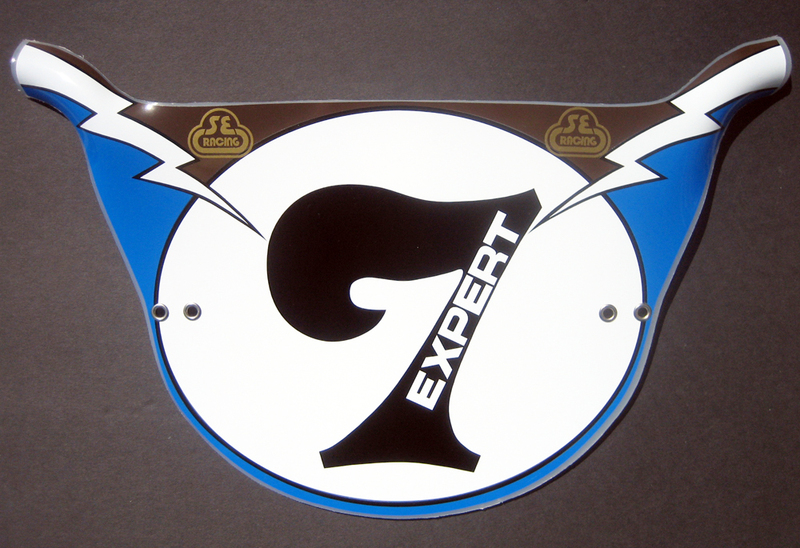 Torker’s First Factory Team earned the rank of National Number One in 1979. 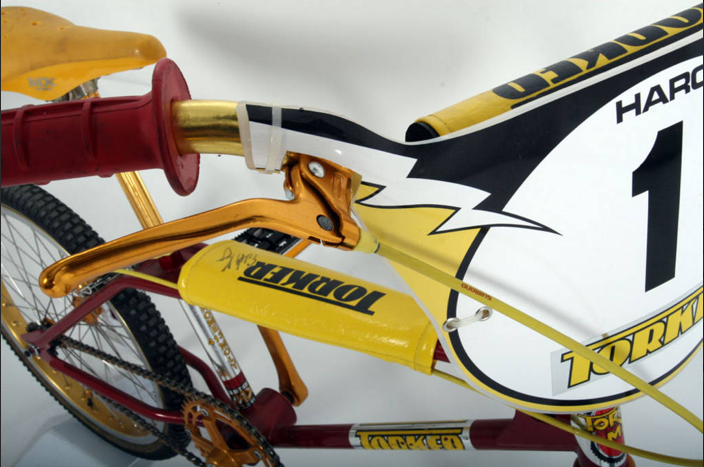 The list BMX Hall of Fame members who flew the Torker colors at one time during their careers is impressive. It includes Eddy King, Clint Miller, Tommy Brackens, Kevin McNeal, Bob Haro, Mike Miranda, Richie Anderson and Mike King. Other notable Torker Team members include Doug Davis, Jason Jensen, Doug Olson, Kathy Hannah, Kelly McDougal, Willie Huebner, Dave Marietti, Craig Bark, Jennie Zeuner and Todd Corbitt. Steve was a talented promoter. Besides using racer and event sponsorship, he developed strong relationships with the media. Between 1977 and 1984, the Torker logo appeared on hundreds of magazine pages. In addition to his role as brand builder, Steve, with his mother Doris, father John and brother Doug, ran Torker and Max while overseeing the Torker factory in Fullerton, CA. He also had a hand in designing Torker’s celebrated frames and components. 1976: Steve takes control of his father’s small, contract, MX frame production company, Texon. He renames it Johnson Engineering and buys the company’s first production tooling. Johnson Engineering builds early frames for Peddlepower (later Powerlite) as well as the first Torker frames. 1977: Steve renames the company Torker, using the word torque as his inspiration. He introduces the first Torker frame, an all-4130-chromoly, air-craft-quality, heli-arc welded and stress-relived frame that was designed with the aid of structural engineers, metallurgists and aircraft welders. The technologically advanced frame was met with rave reviews from the media and was an instant success. He shows an eye for picking talented riders and signs Kevin McNeal to ride for Torker. 1978: Torker redesigns its frame to better meet market demands and adds a variety of new models as well as a fork. All are well regarded in the media as well as among racers. 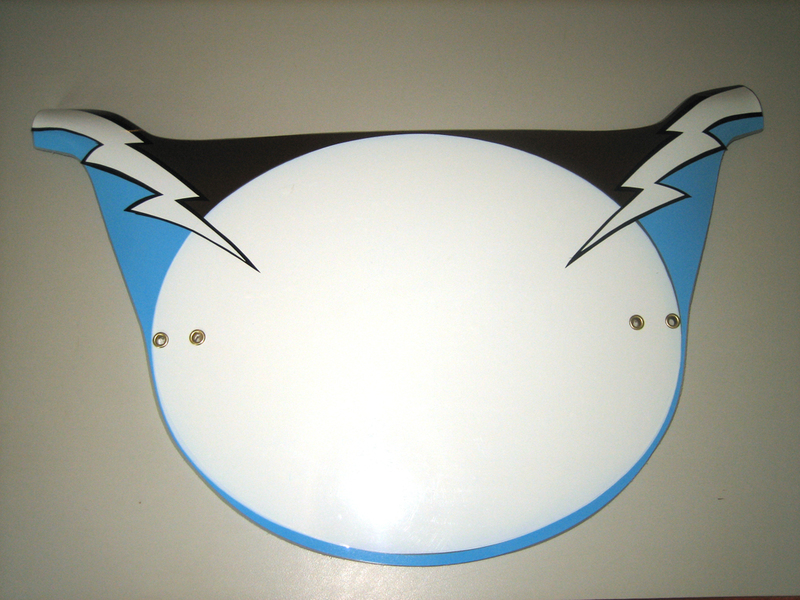 He signs Eddy King and introduces an Eddy King Replica frame, one of the first racer replicas. King, one of the fastest amateur racers in the world at the time had been cosponsored by Torker and Wheels-N-Things. Torker sponsors numerous local, regional and national races. 1979: Steve builds one of the all-time great teams in BMX history. 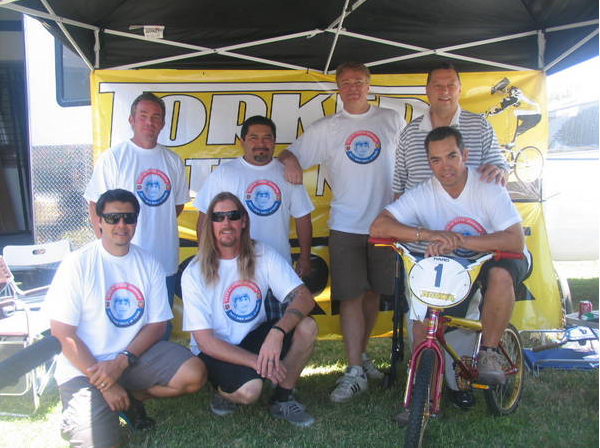 Among the racers of the team were Eddy King, Jason Jensen, Mike Aguilera, Doug Davis and Doug Olson. Clint Miller joined Torker later in the year. The Torker Factory Team hits the road in an RV on a national tour. The team earns the National Number One title. Torker continues to heavily sponsor races as well as bike shop teams and local amateur racers. Torker introduces two bike models. Sales boom. 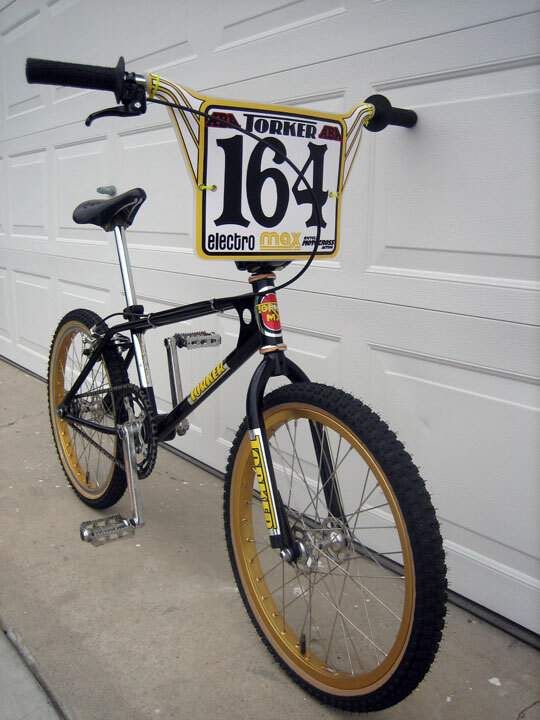 1980: Torker riders continue to dominate their respective classes while Steve continues to promote and build the company, adding products and getting press for Torker racers, products and sponsorship of national race events. (See BMXA article above.) 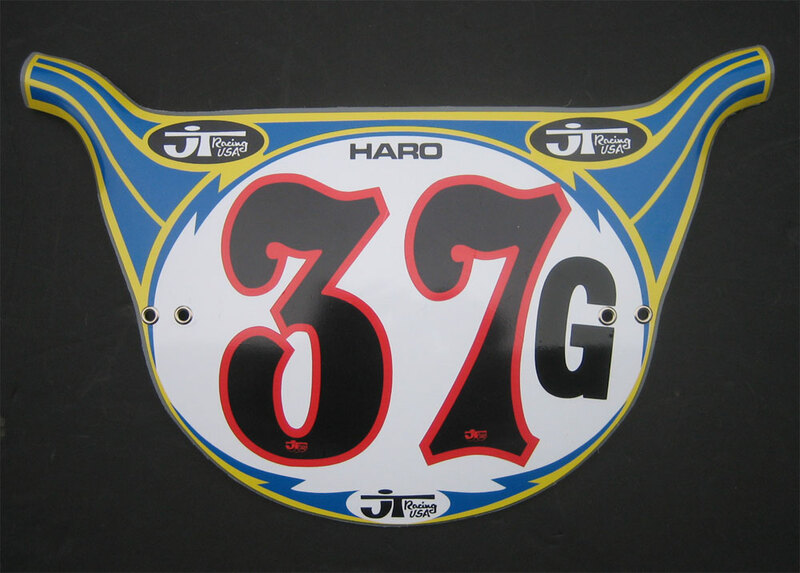 He sponsors freestyle pioneer Bob Haro. Max clothing and accessories is added to the Torker family. 1981: Despite losing Eddy King and Doug Davis to Diamondback, Steve continues to garner huge amounts of press with Torker products and the racing success of Jason Jensen and Clint Miller. 1982: Steve adds Kelly McDougal and Dave Marietti to the Torker Team. The company, its racers and products continue to get massive exposure and positive reviews in the magazines. Responding to market demands, Steve takes the company in a new directions with lower-cost complete bikes. New products continue to hit the market. Clint Miller dominates the Pro Cruiser Class on Torker’s new 24” cruiser. 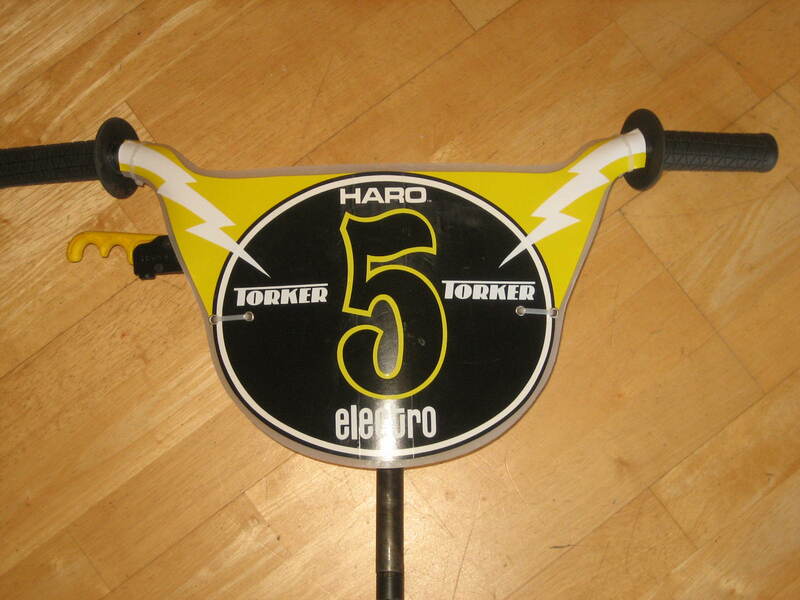 Torker begins producing frames and forks for Bob Haro’s Haro Bikes. 1984: Steve attempts to bring new glory to Torker by building another team of star racers. The team has impressive results and brings new attention to Torker. Steve compares the team to the original Factory Torker Team of 1979. The team includes Mike Miranda, Tommy Brackens, Richie Anderson, Craig Bark, Willie Huebner, Jason Foxe, Jennie Zeuner, Todd Corbitt and Jason Theodore. Sadly, after years of losing money and despite Steve’s effort to save Torker, the Johnson Family decides to close the company’s doors. Torker and its assets are sold at auction. 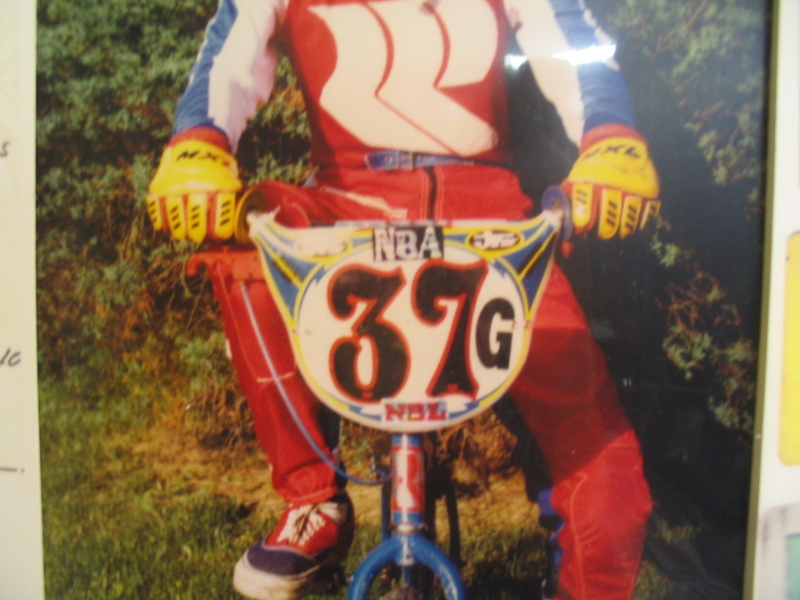 Steve quietly retires from BMX racing and the bike industry. He takes a job at Hughes Aircraft in Fullerton, CA, where he works for 20 years until his retirement. He also was a volunteer for various organizations. The Post-Johnson Years According to McGruther who was there, in November 1984, the owner of Seattle Bike Supply (SBS) bought the bankrupt company at public auction. “Bob Morales bought the Max name for $300. Seattle Bikes bought the Torker name for $3,000. I bought my wooden desk and office chair for $25,” he said.